Along with the launch of Zenfone 3 Deluxe, Asus also unveiled its latest Android Tablet under the name of ZenPad 3S 10. 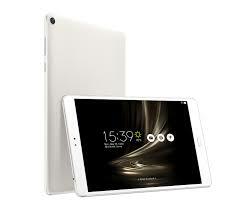 This is a Hexa Core powered tablet which will perform exceptionally well when it comes to the case of multi-tasking. The high resolution display also adds to premium features of ZenPad 3S 10. Let us have a peek into the features of ZenPad 3S 10. The thickness of ZenPad 3S 10 comes to be only 5.32 mm which is almost 0.28mm thinner than the premium branded Samsung Galaxy Tab S2 9.7. With a weight of just 15 ounces, ZenPad 3S 10 appears to be lighter than other currently tablets in the market. The display of ZenPad 3S 10 comes to be 9.7 inches edge to edge. It provides quite a larger view of the contents and a feel of using a notebook PC. The resolution comes to be extensive and huge with a resolution of 2048*1536 pixels. The screen appears to be LCD make. ZenPad 3S 10 is functioned with the help of MediaTek MT8176 processor. This processor is comprised of dual ARM Cortex-A72 CPU cores and four ARM Cortex-A53 cores. It is also enhanced with PowerVR GX6250 graphics which will further enhance the processing capability of the ZenPad 3S 10. ZenPad 3S 10 functions without any processing with an extensive RAM of 4GB along with an internal storage capacity of 32GB. Further this storage can be expanded with the help of microSD memory card. The 8MP main snapper help you to capture images with utmost clarity. ZenPad 3S 10 also offers a front cam featured with 5MP lens which will allow you to have selfies with your loved ones. ZenPad 3S 10 is featured by Fingerprint sensor also. On connectivity end, ZenPad 3S 10 supports WiFi connectivity with 802.11ac and Bluetooth connectivity with v4.2. ZenPad 3S 10 offers USB Type-C connectivity. Audio support is granted with DTS audio featuring 24-bit/192 kHZ audio output with the help of headphone. ZenPad 3S 10 runs with the help of 22Wh, 5900 mAh battery which will keep it function for the whole day. The Quick Charge 3.0 helps you to charge up ZenPad 3S 10 to full within less than an hour. ZenPad 3S 10 will be initially available in Taiwan from August onwards. The price is fixed at $340. For the time being information regarding availability of ZenPad 3S 10 in other countries is not available.